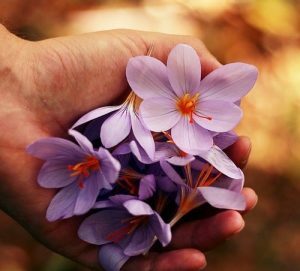 Purple is seen everywhere these days. Ultra Violet is Pantone’s 2018 color of the year. And from hair color, eye shadow and clothing, purple is taking center page in style magazines: People, InStyle and Essence to name but a few. Not to mention, Rihanna, a true style icon, has been seen wearing lovely lavender shadow to accent her eyes. So. It’s not surprising that one of HGTV’s top garden trends for 2018 is purple plants. And we’ve got a few ideas today to help you choose bright pops of purple that can be planted throughout the 2018 season — beginning this spring. Blooming in late spring, perennial Salvia Sylvestris May Night (May Night Meadow Sage), seen here in the right foreground, boasts deep purple-blue blooms. 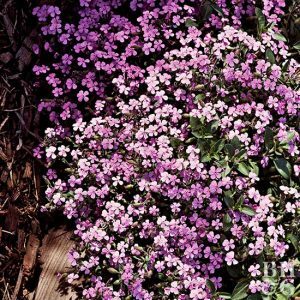 The good news for gardeners in our Long Island, NY, area is how hardy this beauty is for our area of the Northeast because it claims superb cold hardiness, is a vigorous plant, and is tolerant of heavy clay soils. If the robust color isn’t enough to make you rush to pick up some of these Salvias, consider: these plants attract butterflies and hummingbirds, and are deer and rabbit resistant. 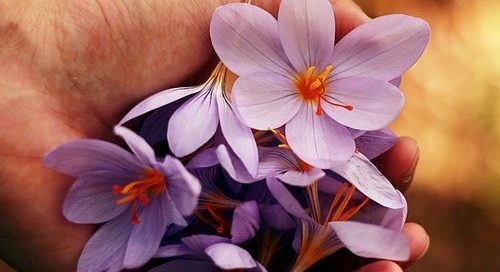 They make glorious cut flowers for inside and they bloom more than 4 weeks. Another easy to grow stunner for spring is Soapwort. It’s also called Bouncing Bet which is a clue on how prolific it is. It prefers full drainage and full sun and if you have a wall or trellis, it’ll make a home there. 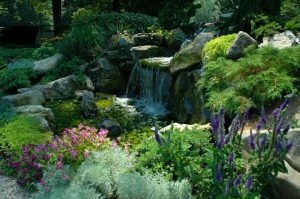 It’s also available in low ground cover form that spreads nicely and is ideal around a water feature: stream, pond or waterfalls. Its family name is Saponaria officinalis and offers good cut flowers. Available in annual and perennial varieties (a total of 250 varieties in fact), this stunning flora is at its best during the hottest of summer heat. 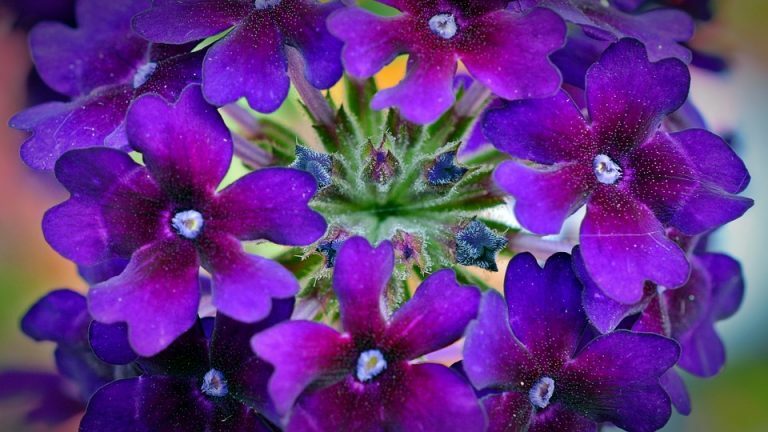 With so many varieties, it’s a cinch to find a glorious purple specimen for your garden. 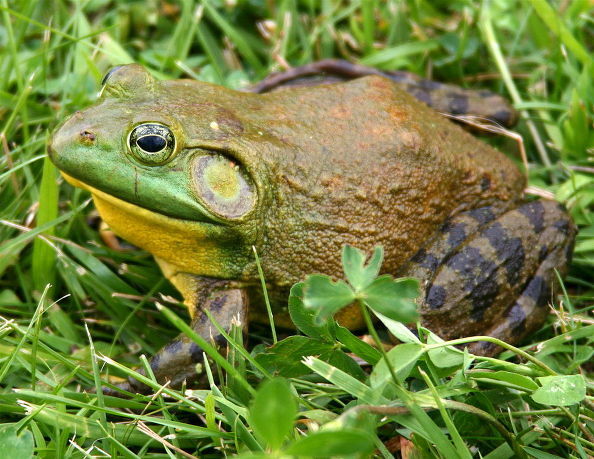 Often used in herbal teas, it’s beloved by more than humans. Yup. Butterflies and hummingbirds adore its blooms as well. 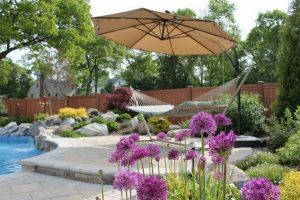 Although planted in fall, the Purple Allium Sphaerocephalon seen in the foreground of this Deck and Patio project is a summer blooming delight. Its robust color thrives beautifully on Long Island and in the Northeast in general. Deck and Patio landscape designers chose the Purple Allium for its height, as well as the lovely color contrast it made against the green and yellows around it. The plants first open green, and then mature to a bright crimson-purple. More good news. It’s rabbit, deer and rodent resistant and is loved by pollinators. 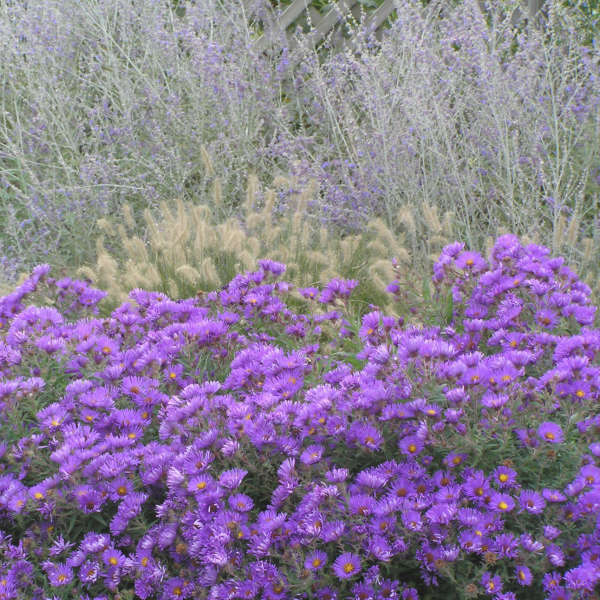 The Purple Dome Aster (novae-angliae) is a beautiful autumn plant that blooms from late summer in to autumn. 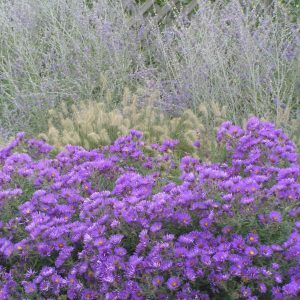 It is a dwarf variety of the more common New England Aster. And as you can see from the photo, it makes a wonderful impact as an accent among fall grasses. Needless to say it can be cut for beautiful indoor bouquets. 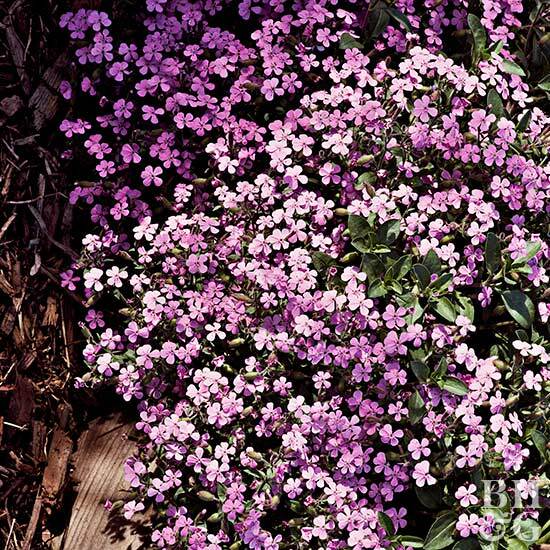 Indeed, there’s lots to cut as these plants boast masses of daisy-like deep purple flowers. They also have a sunny yellow center. These beauties will bloom for over 4 weeks in fall; in spring and early summer they show off gray-green leaves. 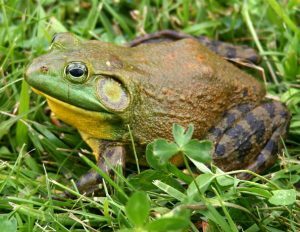 These disappear under the royal purple daisies in fall. The Callicarpa dichotoma or purple beautyberry shrub’s colorful purple berries are a treasure in winter. They begin to bud in fall and last throughout winter. The shrubs grow up to 4 feet tall. The branches boast pinkish to light purple flowers in summer which mature to these delightful berries in autumn. These plants accept full sun and partial shade, which is good news. It gives you more options for planting and are not very demanding when it comes to growing conditions. 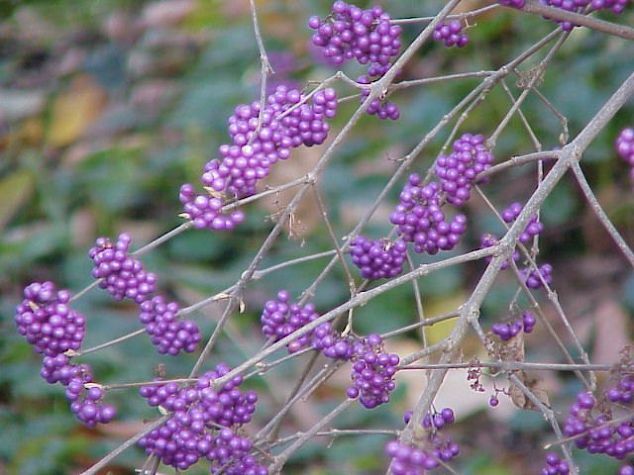 So as your starved eyes search for color in winter, your beautyberries, in bright purple, will satisfy that need. Do any pruning in late winter, just before spring. And as for your winter birdies — they’ll eat some of the purple berries. We all know what makes a purple garden grow: a little Purple Rain. Now it’s Prince, after all, so you’ll have to be a little patient for the video to begin (at about 1.08 mins). But oh, his Purple Rain. Enjoy! Time to Update Your Backyard Pool Area? 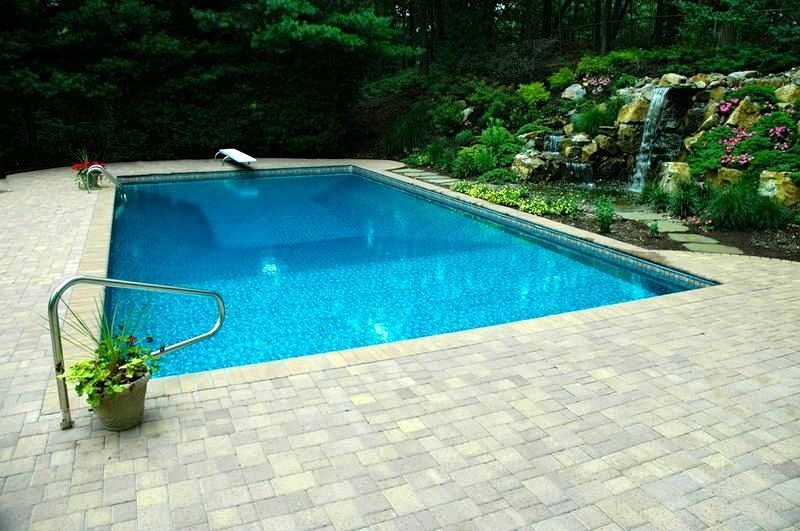 When this Dix Hills family decided to update their dated backyard pool area, their main problems were that their old wood deck and red brick patios (above left photo) beside the pool were too small and unusable for parties and entertaining. 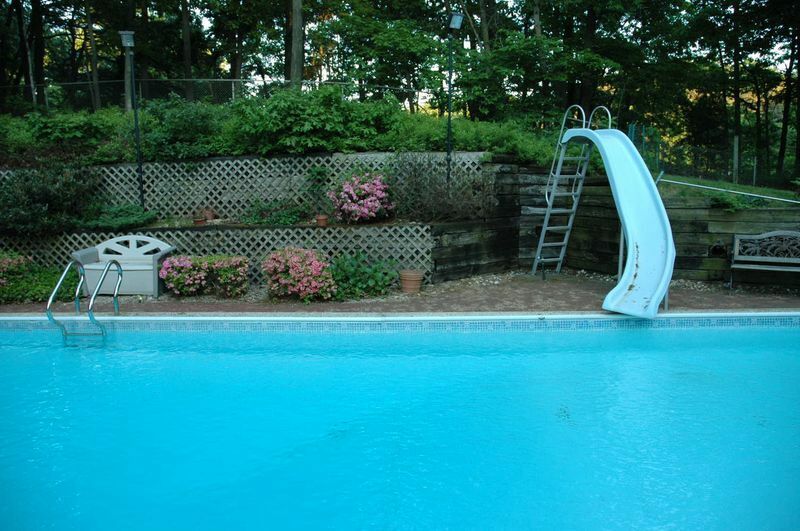 In addition, the old retaining wall took away from the attractiveness of the pool area. 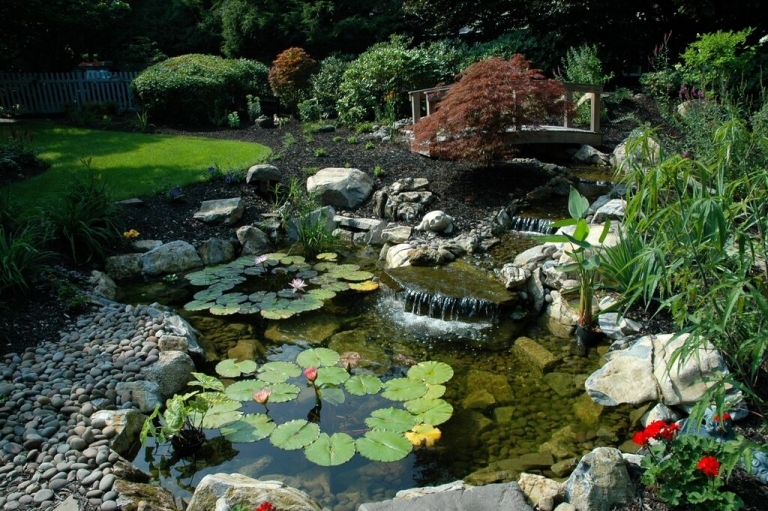 Our creative team introduced a unique concept to deal with this area: re-grade the slope, turning it into a “natural” retaining wall (above right photo) including a dramatic waterfall, stream, and woodland garden in its place. 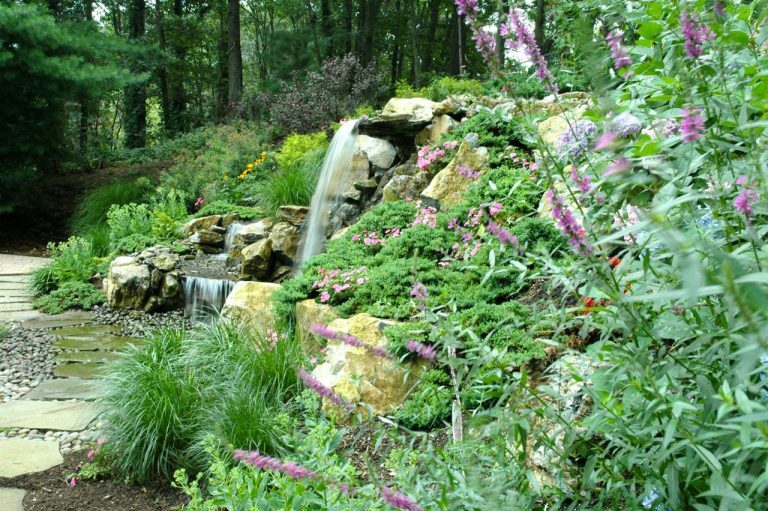 For the seven-foot-high “sheet” waterfall and stream, we used Aquascape Inc.’ pondless waterfall system, which allows for a good deal of water volume to create the dramatic effect. 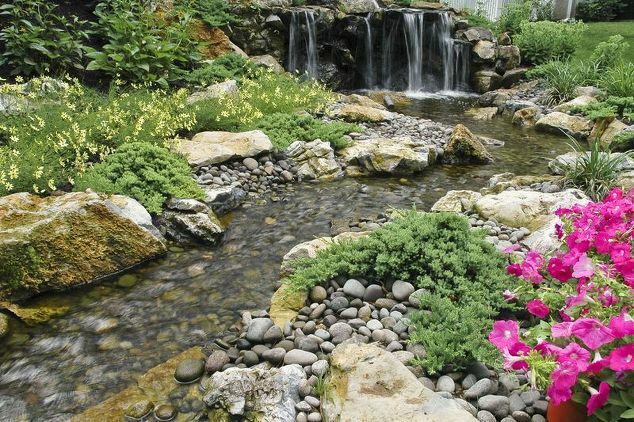 Another reason our waterfall retaining wall system looks so natural is our waterfall installation team understands how water flows over rock and how it releases from the rock in order to create a natural look and feel. We avoid the look of steps in the waterfall by making the water change directions in the waterfalls and streams. Once the stream and waterfall was complete, we pressed boulders into the surrounding slope. After that, we addressed the landscaping. Our crew installed natural woodland plantings to tie in with the tall oaks that exist on the property’s perimeter and added evergreen shrubs to ensure year-round color. With the slope stabilized, our team addressed pool renovation. After draining the pool and removing the original liner, a poorly built concrete block wall was uncovered. The solution was to straighten the wall and fill the block in with concrete and steel rebars for strength. New vinyl covered stairs were then added, as well as new pipes, returns, skimmers, pump, filter and new liner was installed. After this, the pool was carefully backfilled and tamped. We compacted the soil back around the pool in three-inch lifts to allow for the immediate installation of new pavers around the pool. This compacting process is not done by many contractors. 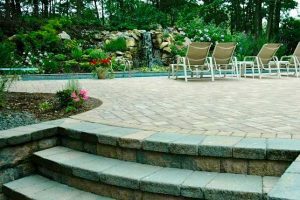 The idea is that using compacted soil the base will not settle, so you don’t have to wait to install a patio around a new pool. Many contractors still install concrete slabs under their patio. In our experience we find this does not work well. Settling still occurs under the slab allowing the patio to crack or settle. After the base materials were finished, we installed chestnut-hued durable pavers from Cambridge (Sahara). These particular pavers have little or no color fade and the random design pattern adds interest to the patio. The pavers’ protective coating means these clients will have a clean-lined modern look. Even after being subjected to snow plowing, de-icing salts and normal wear, they will keep their color and beautiful appearance. 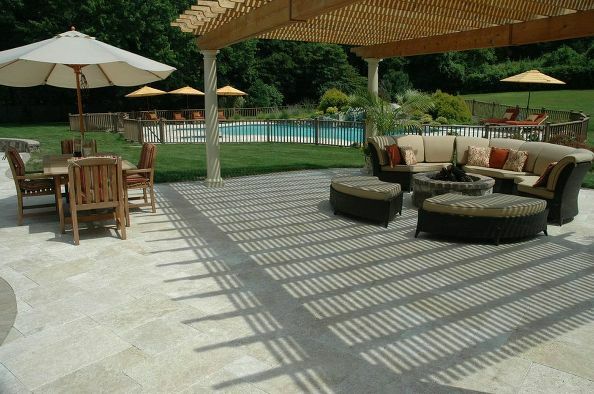 The clients chose elegant clean-lined pavers in a random pattern for the new patio areas surrounding the pool. The clients love their new patio and pondless waterfall. 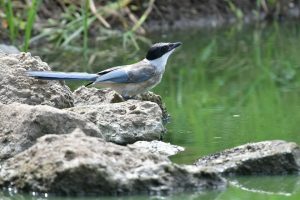 Not only do they find themselves outside more often enjoying nature’s sights and sounds, they have room for parties and entertaining. In fact, their perfect backyard was there all along — it just needed a vision to bring it out. By June Sullivan|2018-04-14T13:15:11-05:00April 14th, 2018|Aquascape Biofalls, Backyard Escapes, Backyard Refurbishments, Backyard Upgrades, Creative Design, Deck and Patios, Design and Build Experts, Landscaping, Outdoor Living, Patios & Decks, Plantings/Pondscapes, Ponds & Water Features, Pool Surrounds, Pool Upgrades, Pool Waterfalls, Retaining Walls, Unique Ideas, Updating Landscape, Vinyl-lined Pools|Comments Off on Time to Update Your Backyard Pool Area? Is Travertine Right for My New Patio? Understanding what Travertine is, its strengths and weaknesses, and how it reacts in different areas, is something members of our team have discussed with stone experts from around the world. We have also studied existing Travertine projects over a period of years to see what actually holds up — and what doesn’t — in our climate. Travertine natural stone has been in existence for thousand of years. It comes in many different colors, ranging from reddish orange, beige, to white, and is sometimes mistaken for marble. Italian Travertine, revered for its hardness and porosity, is what the Coliseum in Rome was constructed of, so the durability of Italian Travertine is not in question, although it can be expensive. However, Travertine is quarried from around the globe and is widely used beyond Italy — mostly in tropical locations for patios, walks, terraces, etc. Although it is typically used indoors in colder climates, there has been an increase in its usage outdoors, in and around pools and homes. But can all Travertine stone be used this way? The answer is no, or at least it shouldn’t for best results. 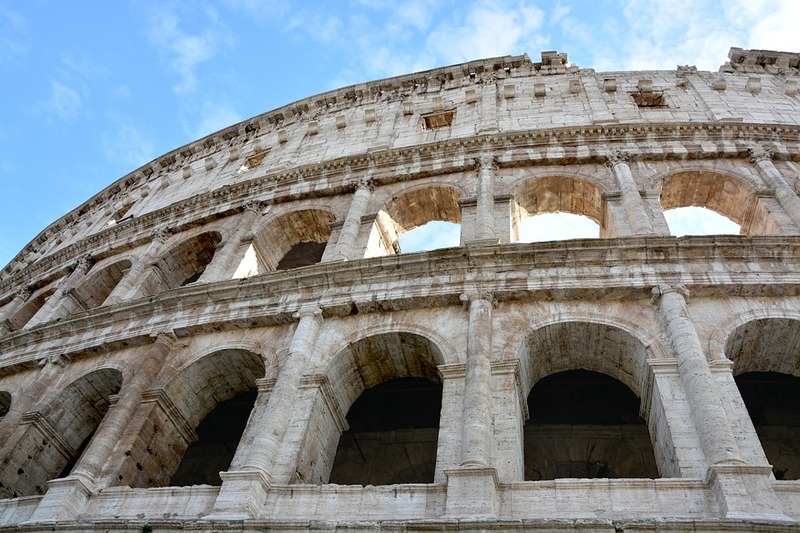 The three most common locations where Travertine comes from are: Italy, Turkey, and Mexico. Mexico’s Travertine is a much softer and much more porous and does not hold up well in our frost zone. Turkish Travertine, is very common and, in most instances, is less expensive than the Italian. It does hold up quite well in our Northeast’s freeze/thaw climate. Be aware, however, that some companies offer very inexpensive Travertine for use outdoors and may seem to be a great deal. However, they may be using stone quarried in, say, China, where the qualities of such stone differ considerably and will not stand up to certain climates. Just because a stone is called “Travertine,” don’t assume it’s all the same. It’s not. 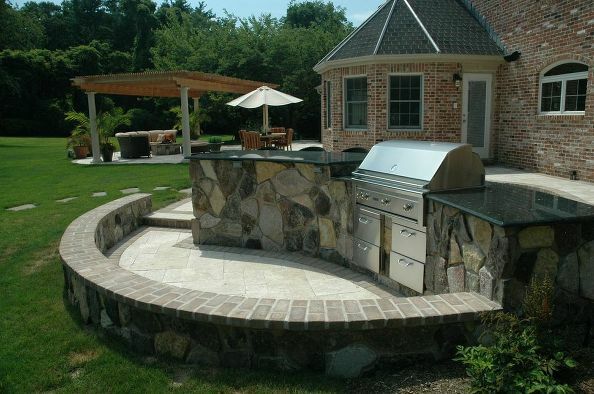 Below, we are highlighting an example of a Travertine (from Turkey) patio we built for clients. 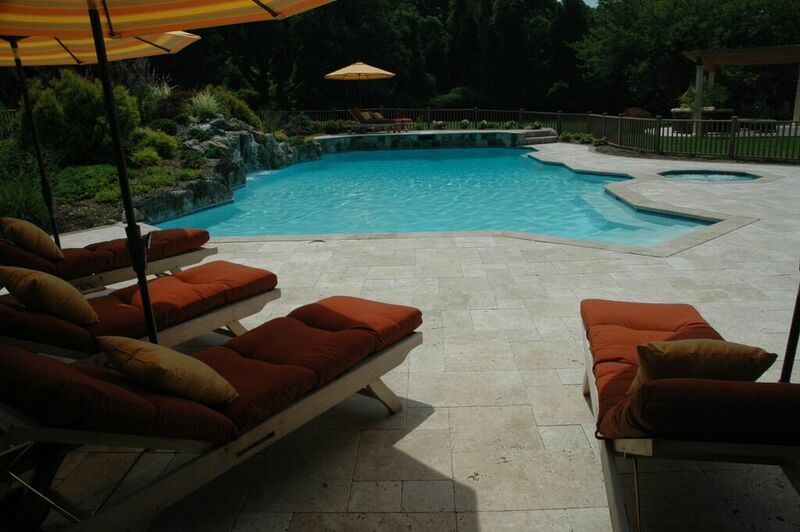 For this expansive Travertine patio, Deck and Patio installed Travertine from Turkey — for its beauty, density and porosity — which we could guarantee would withstand our area’s severe climate changes and maintain its elegance. The look of Travertine is exquisite. It has a smooth surface with small pores and dimples that give it an “old world finish.” This particular project used well over 2,500 square feet of Travertine, and over 180 linear feet of fullnose coping for the pool and spa. In our area of the Northeast (Long Island, NY), the summer sun gets intense. However, Travertine does not absorb the heat like brick or bluestone, and is similar to light-colored concrete pavers where heat is not retained in the paver. This makes it ideal as a pool surround, where being barefoot is unavoidable. 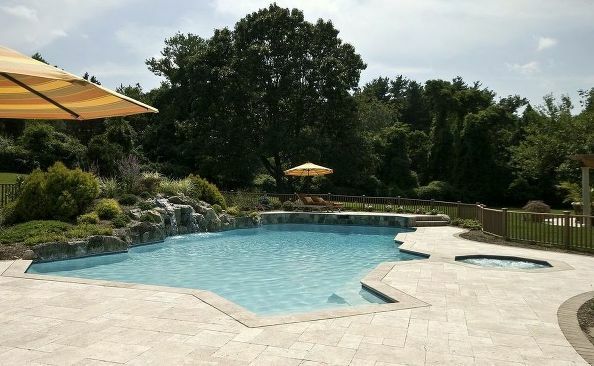 The Travertine stone we used for this project enhanced the geometric shape of the pool and it was decided to elevate the diving area for added interest. 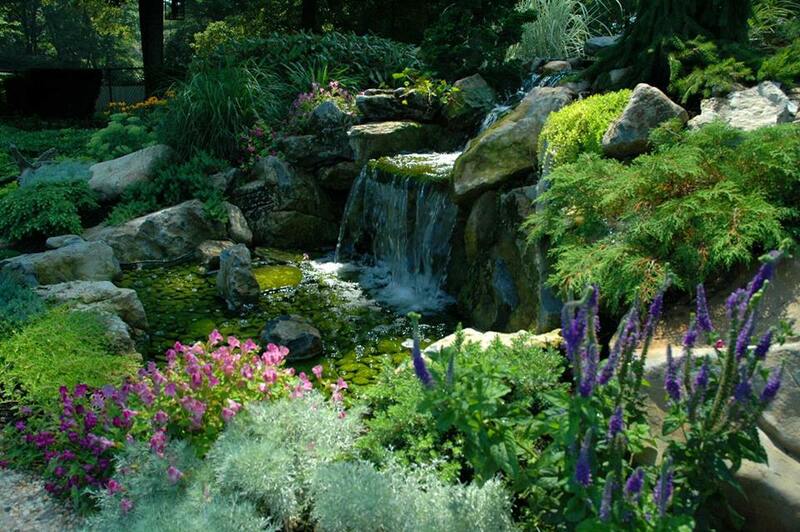 This raised area offers a quiet escape for relaxing; bright plantings add to the pleasure of it all. Travertine doesn’t absorb heat like other materials and offers an elegant contrast to robust lawns and plantings. By June Sullivan|2018-04-05T14:31:51-05:00April 5th, 2018|Backyard Refurbishments, Backyard Upgrades, Creative Design, Deck and Patios, Design and Build Experts, Landscaping, Patios & Decks, Pool Surrounds, Terraces, Unique Ideas, Updating Landscape|Comments Off on Is Travertine Right for My New Patio?